Nash McQuarters Can Tuition-Free College Change a Community? Topic: Can Tuition-Free College Change a Community? Nash McQuarters is a Tulsa native and graduate of Oklahoma State University with a Bachelor of Arts in Sociology. 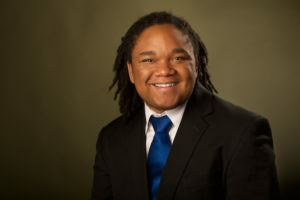 Nash currently serves as the Senior Admission Counselor for Tulsa Community College, where he promotes higher education at TCC to high school students within the Tulsa area. Over the past five years, he has promoted the Tulsa Achieves program to thousands of students, hosted application workshops for both TCC and Tulsa Achieves, and served as the lead for prospective student communications. At TCC, Nash has served on various committees for the TCC/NAACP Conference, TCC Hispanic Student Luncheon, and African American Male Student Success Team. Nash co-founded two programs at TCC to actively recruit underrepresented populations: the Believe Conference for black males, and OUT for TCC, a program to recruit LGBTQ students. Over the past 10 years, Nash has also volunteered over 1,500 hours in the community through various performing arts organizations.